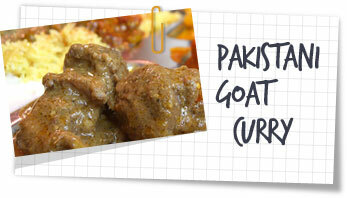 I’ve eaten goat a few times over the years, but never cooked it. So, when I saw how cheap it was in the local butchers I just had to snap some up. I have a cold at the minute so settled on a recipe which would give me plenty of spice in the hope it will sort me out. This curry has all the heat you’d expect from Pakistani food but the spice appears to come more from the black peppercorns than the chilli. It’s an unusual and rather delicious flavour. As for the goat, so long as you cook it for long enough it’s tender as can be. It’s pretty similar to lamb albeit a bit bonier. If the thought of eating goat fills you with horror then try this recipe using the equivalent weight of lamb shanks instead. In a blender or pestle & mortar, blend the onion, garlic and ginger with 4 tablespoons water into a smooth paste. Set aside. Heat a large stove and ovenproof casserole pan over a medium heat. Brown the goat in batches on all sides then remove to a plate. Now add to the pan the cumin seeds, peppercorns, cloves and cinnamon and stir for 10 seconds. Add the onion paste and stir fry for 4-5 minutes until golden brown. Remove from the heat. Add 1 tablespoon of the yoghurt and stir well. Now add the remaining yoghurt, coriander, chilli powder, turmeric and salt and stir well. Top up with 450ml water stir, then return the goat to the pan. Place over a medium/high heat until the sauce begins to simmer. Remove from the heat, put on a lid and then cook in the oven for 2 1/2 -3 hours. Stirring every 30 minutes. Place the pan back on the stove over a medium heat and let it simmer for 5-8 minutes to reduce the sauce until thick. Add the lemon juice and adjust the salt to your taste if necessary. Sprinkle over the chopped tomato and serve with Indian breads or rice.